Steering Test Equipment: Software & Hardware - MB Dynamics, Inc.
MB deliverables to help fulfill application test requirements, or jobs-to-be-done, consist of software for multi-test-head, synchronized MIMO closed-loop control and data acquisition; rotary servo motors for attachment to a steering spline or wheel; electrodynamic shakers; long-stroke linear motor actuators; pneumatic actuators; column stands for mounting steering column; gear fixture for mounting the gear; instrumentation (force, torque, displacement, rotary position, acoustic, acceleration); fixtures for mounting gears and columns; brackets, clamps, and fixtures for holding test items; jounce/rebound fixtures and tilt positioners for aligning input forces with tie rods at angles; software and associated data acquisition hardware up to 16 channels for recording, analysis and evaluation of in-lab steering noises and accelerations, road load data acquisition, and general Sound & Vibration analysis; and engineering services to accelerate test effectiveness. The Steering Module Test Simulator (SMTS) is a quiet (acoustically and electrically), non-hydraulic, turnkey lab test system consisting of a customer-specific combination of equipment and software that simulates DRIVER functions into the steering column or wheel and ROAD & VEHICLE inputs acting on a STEERING SYSTEM through the tie rods. An SMTS is useful to experimentally develop, evaluate and validate countermeasures and NVH metrics and to experimentally verify EPS functions in order to achieve performance goals over the customer-equivalent useful life of a steering system. The SMTS is applicable to rack-mounted and column-mounted EPS as well as other steering technologies. When installed inside an acoustic enclosure or hemi-anechoic chamber the SMTS can be used for low-noise measurements. 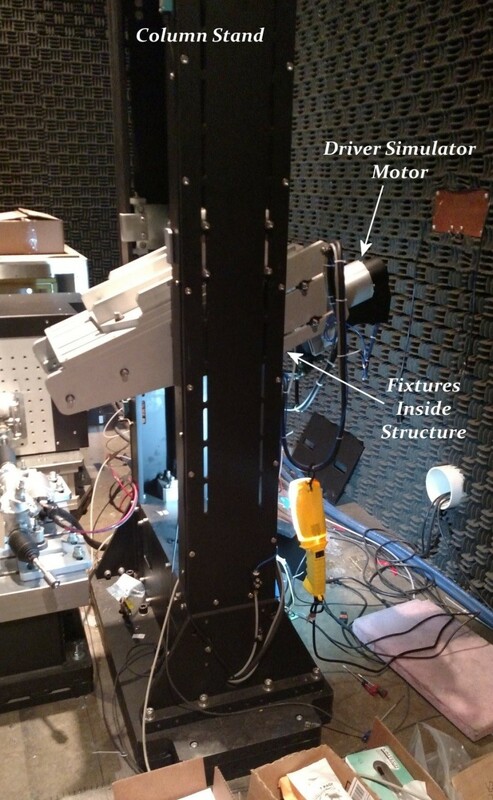 In-lab acceleration measurements have been correlated with in-vehicle acceleration and noise measurements. This validates that countermeasures proven with in-lab-measured, structure-borne noises can be confidently used to guide their implementation in steering systems installed in vehicles. MB equipment fulfills GMW16216 and GMW17112. 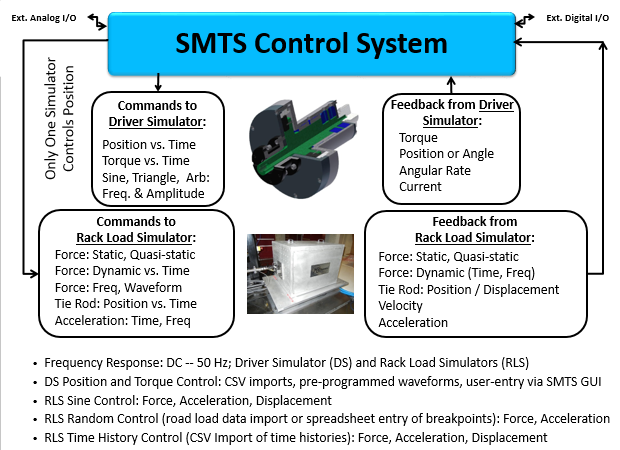 This MB Millenium SMTS software provides an executive function over the embedded control systems for the MB Driver Simulator (DS) and the two MB Rack Load Simulators (RLS). This executive software assures that only one embedded sub-system performs position control over the steering spline or the two tie rods. It provides “fail safe” interlocks and shutdowns in the event of over-test or under-test. It provides for E-STOP functionality. It provides menus for inputting commands to control the Driver Simulator and the Rack Load Simulators, it acquires and conditions sensor responses used for closed-loop control, and it provides analog I/O and digital I/O mutually agreed between MB and the end-user as being information available from SMTS and capable of being output. 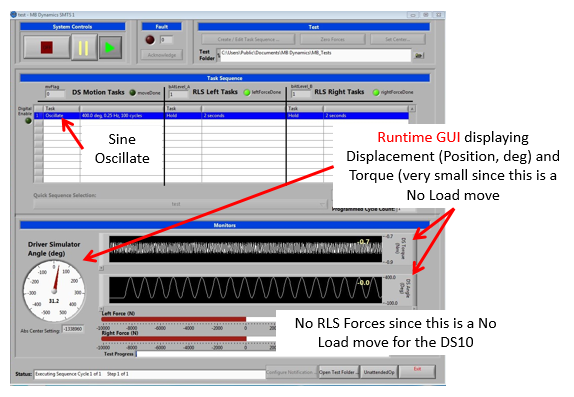 Steering-specific GUIs & closed-loop software control of Rack Load Simulators under user-prescribed motion profiles — imported from CSV files or simulated by user — such as tie-rod force synchronized with DS position, force vs. time, replicating sine, trapezoid, PSD random, and time waveforms. The MB Driver Simulator product family offers extremely quiet, repeatable closed-loop controlled rotary motion. Driver Simulators are used to simulate driver functionality by generating repeatable and precise steering maneuvers of position/angle, angular rate, or torque using imported time histories of measured drive files or user-customizable sine, triangle, and trapezoid waveform plus CSV-imported position vs time and torque vs time. Continuous torque outputs range are 10N-m for a DS10, 25N-m for the DS25, and 50N-m for a DS50 with peak torques 3x the continuous rating. Position resolution is excellent using an encoder with better than 1,024,000 counts per 360 degrees or 0.00035 deg/ count of resolution. This is important for low noise motions and waveform purity. Rotating torque sensors can be installed in-line. Driver Simulators are controlled with a laptop or the test rig PC in a SMTS. 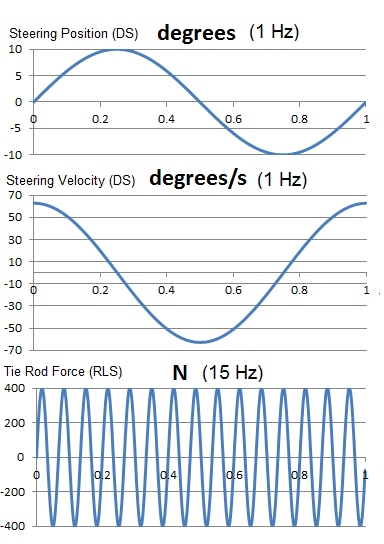 The slotless design of these Driver Simulators avoids cogging or torque fluctuations and enables smooth motion without acoustic disturbances or contamination of the waveform quality caused by lower-cost slotted servos with significant cogging. Driver Simulators are direct-drive so there are no gears or belts which translates to smooth motion. Frictionless porous-media air bearings enable high accelerations and an extremely low operating background noise. Background Noises measured with a 0.025 kg-m^2 inertial payload (no steering column/rack attached) are a measure of Driver Simulator noise that can mask steering column/rack noises. For a 90 RPM, ±500 degree move noise levels measured are <25 dB(A) over the 20Hz – 20kHz audio bandwidth when the @RestReady noises are <23 dB(A). Driver Simulators can be used standalone or in conjunction with Rack Load Simulators. A Driver Simulator may also be used for other applications which require coordinated control of torque, position and acceleration. A Driver Simulator can be used to apply rotary motion to a column connected via an I-shaft and connected to a rack that is being simultaneously excited with road vibrations. The In-Car Driver Simulator (In-Car DS) quietly produces accurate, controlled, inputs to the in-vehicle steering wheel to enable acquisition of acoustic data and wheel motions during zero-vehicle-speed and simulated parking maneuvers to characterize in-vehicle zipper and other steering noises. Much more repeatable motions are produced compared to steering wheel inputs applied by humans. 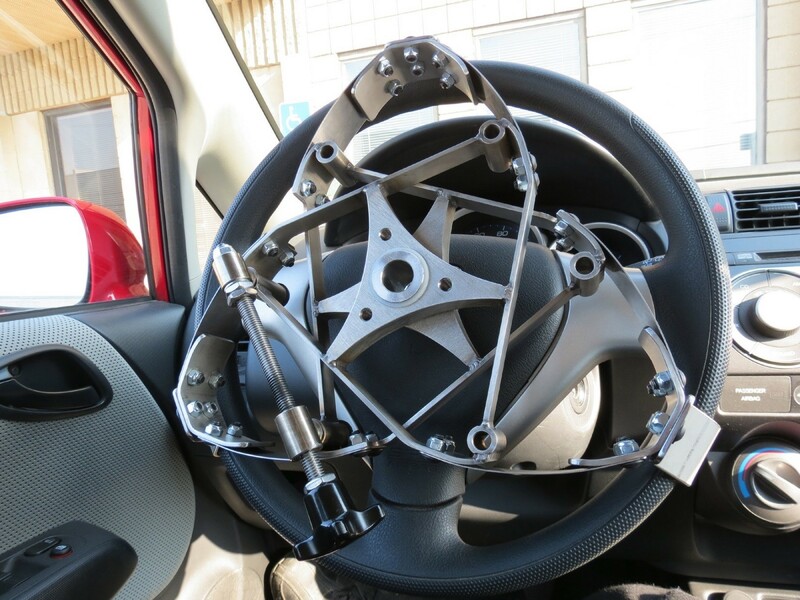 A DS10 Driver Simulator (10N-m continuous, 30N-m peak) mounted in the In-Car DS fixture attaches easily to steering wheels with a wide range of diameters using an innovative clamping mechanism. 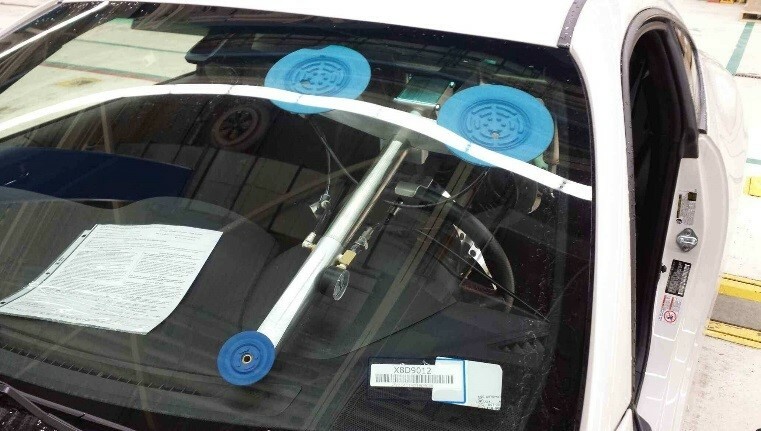 The In-Car DS’s tubular frame holds the DS10 and transfers loads to the windshield, held in place by vacuum cups. It is installed in the vehicle by one person. 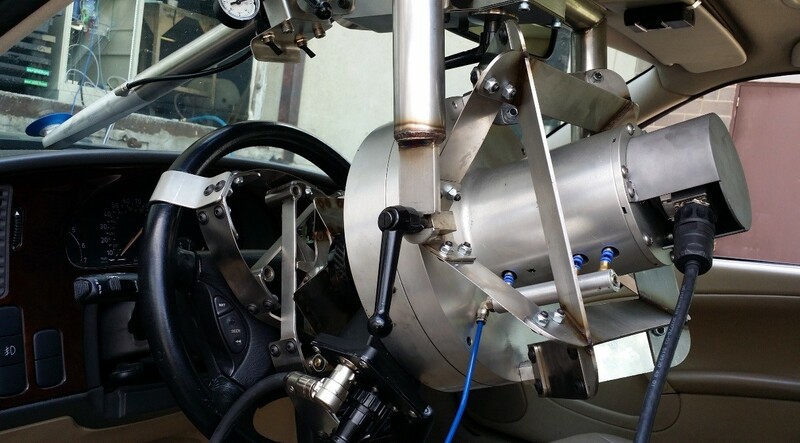 The In-Car DS10 is a slotless (no cogging) electric rotary actuator which generates repeatable and precise steering maneuvers of angular position, rate, and acceleration under PC control. This fulfills GMW14479 using non-human, very repeatable equipment. 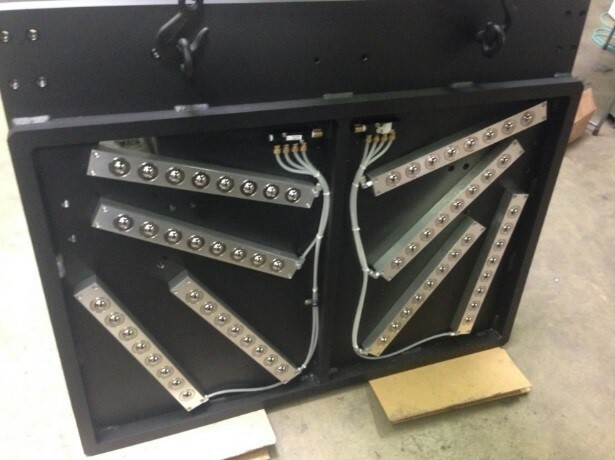 Rack load simulators (RLSs) are electric, electrodynamic or pneumatic devices that apply programmable static, quasi-static and dynamic loads to one or both tie rods (synchronized with each other), delivering force vs. steering wheel/column position or force vs. time (force time histories) under closed-loop MIMO control. RLSs replicate road and vehicle inputs acting on steering gear tie rods (single or double-ended) for rattle and performance tests under synthesized waveforms or measured road load conditions. 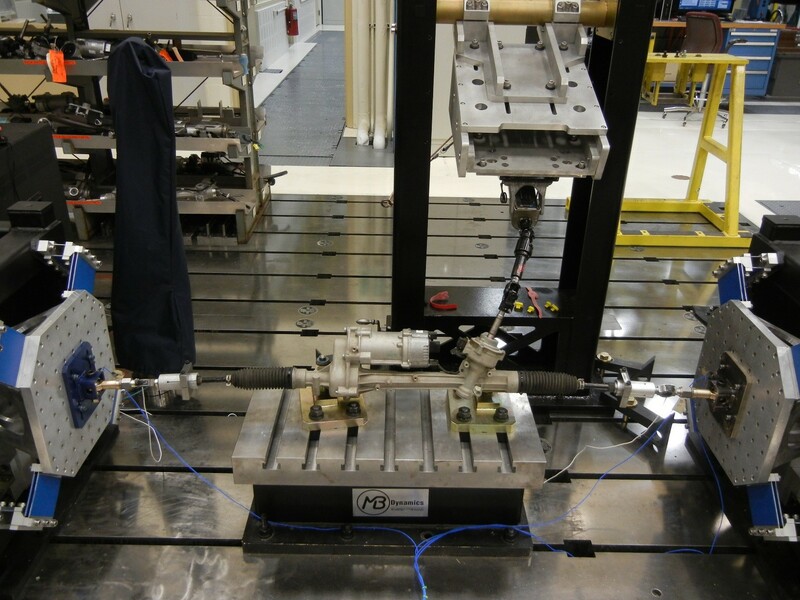 RLSs are used for in-lab replication of rack rattle, zipper, reversal clunk, clatter, howl and growl, etc. and other running and functional noises commonly heard in the vehicle. The repeatable reproduction in the lab of real driving conditions like lane-change maneuvers, pothole-type transients, cornering events, impacts, critical road surfaces or synthesized events that accentuate gear annoying noises help to identify, diagnose and resolve their root causes. MB RLSs are quiet so acoustic measurements can be performed as well as using acceleration recordings correlated to in-vehicle noise measurements. RLSs can be used to condition or wear gears and other components in the lab to accumulate accelerated customer-equivalent kilometers (life cycle assessment) so that rattle and NVH performance can be on the same test equipment before and after simulated customer usage. 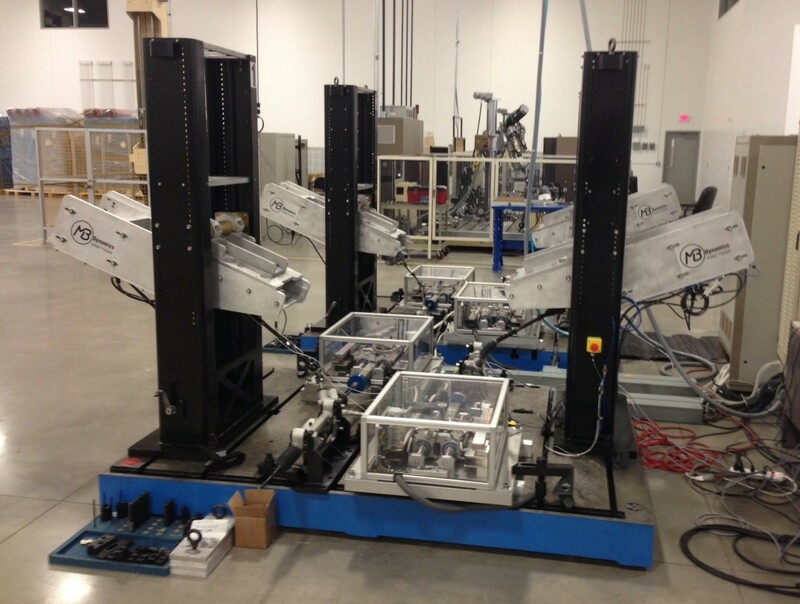 RLS choices include: electrodynamic exciters with 2:1 and 3:1 force multiplying lever arms, direct-drive linear motors, and air spring actuators. Static and dynamic force output, frequency response, peak-to-peak stroke, background noise levels, force slew rates, and cost are factors to consider and trade-off in selecting the right RLS for a particular application. 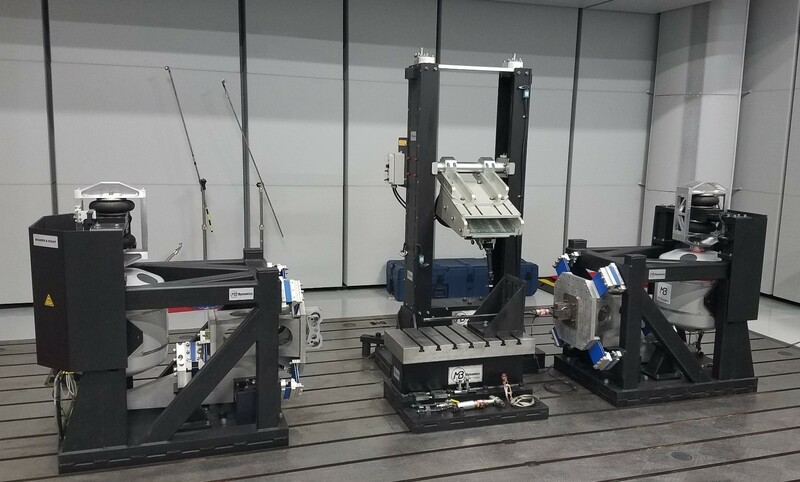 MB’s Column EPS Test Bench, a variant on a Steering Module Test Simulator (SMTS), is a quiet (acoustically and electrically), non-hydraulic, turnkey lab test system used to perform all rattle, NVH and functional tests on a column EPS just like are performed on rack-mounted EPS units. With this CEPS bench a Driver Simulator supplies to the column quiet, repeatable and precise steering maneuvers of position/angle, angular rate, or torque using imported time histories of measured drive files or user-customizable sine, triangle, and trapezoid waveforms plus CSV-imported position vs time and torque vs time. 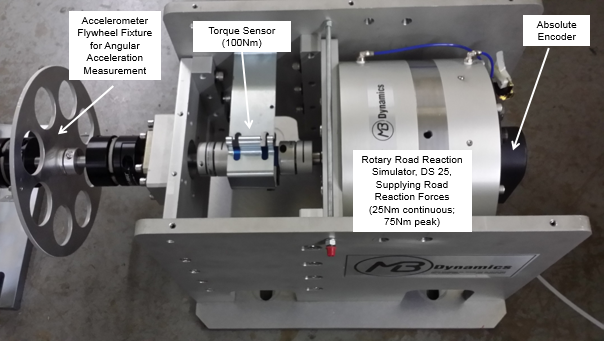 Another rotary servo motor applies Road Reaction torques into the output end of the CEPS unit including torque time histories of real driving conditions like lane-change maneuvers, pothole-type transients, cornering events, impacts, critical road surfaces or synthesized events. Thus tie rods are not excited but only the EPS output shaft. A DS10 Driver Simulator and a DS25 Road Reaction Simulator have been paired but a DS25 could be substituted for the DS10 and a DS50 for the DS25. All Driver Simulators in the MB family are slotless motors which eliminate cogging and associated torque fluctuations that enable smooth motion without acoustic disturbances or contamination of the waveform quality caused by lower-cost slotted servos with significant cogging. Driver Simulators are direct-drive so there are no gears or belts which translates to smooth motion. This CEPS bench is useful for experimentally developing, evaluating and validating countermeasures, NVH metrics, and EPS functions of column-mounted EPS units. 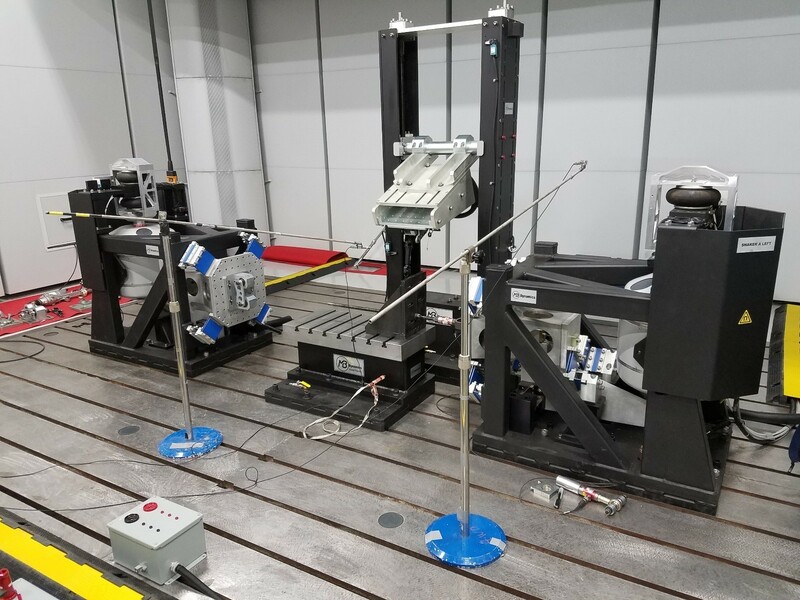 The MB intermediate shaft test system is used to evaluate stick-slip, lash, torsional stiffness, hysteresis and other performance characteristics of I-Shafts, inner tie-rods, columns, couplings and isolators or combinations under environmental, wear and various boundary conditions. The MB I-Shaft system performs stick-slip tests at ambient conditions or, with the I-shaft encased in an environmental hood, at hot & cold temperatures (for example -40 degC to +80 degC) to measure stick-slip performance during long strokes, short frequent strokes, new, after wear, dry, lubricated, and other in-use conditions. 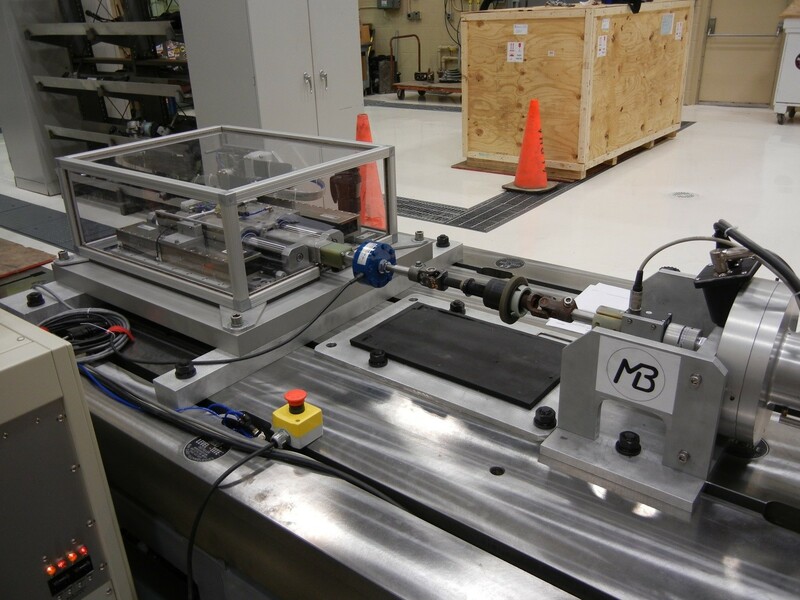 The system uses a long-stroke, ironless linear motor (Rack Load Simulator) to stroke the I-shaft spline providing high and low frequency, long and small displacement sine motions without noise or internal friction that could mask the stick-slip response from the test item. 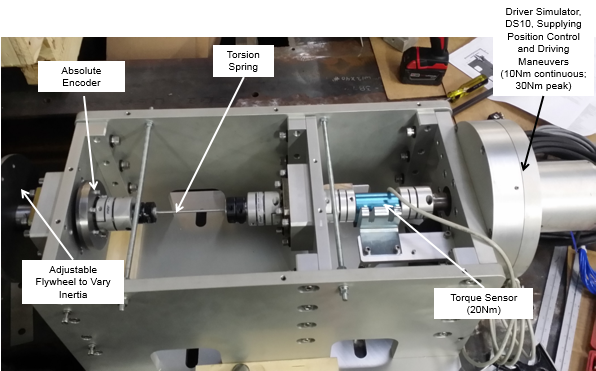 A slotless rotary motor (Driver Simulator) applies varying torsional loads or oscillations to the test specimens. Forces are measured with a load cell and torques with a rotating torque sensor. The bench can be used to fulfill GMW17207 and GMW15599. The equipment can also perform rotating friction and turning torque vs. angular position measurements on I-shafts mounted in their in-vehicle positions during several clockwise and counterclockwise rotations. The bench can be used to fulfill GMW17444. 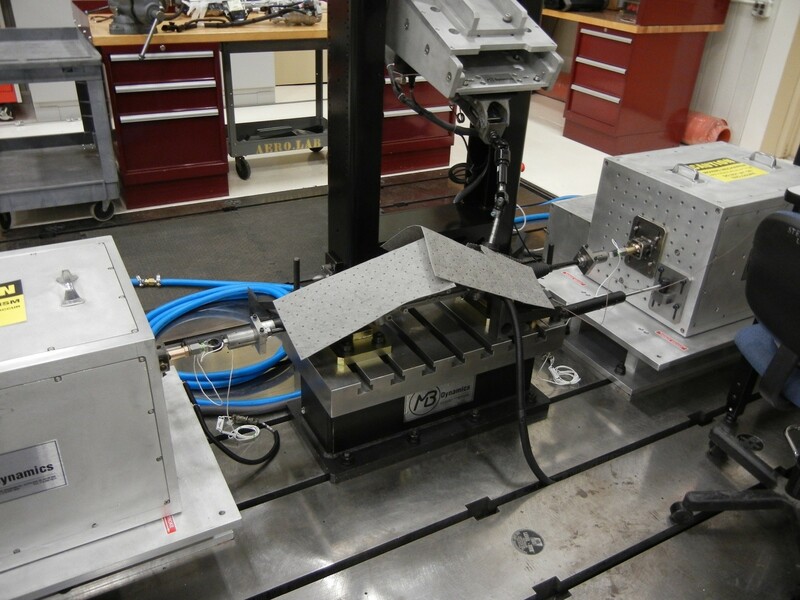 The system can measure and report torsional hysteresis, torsional lash, on-center rate, and off-center rate of an I-shaft mounter per in-vehicle coordinates. The bench fulfills GMW17422. 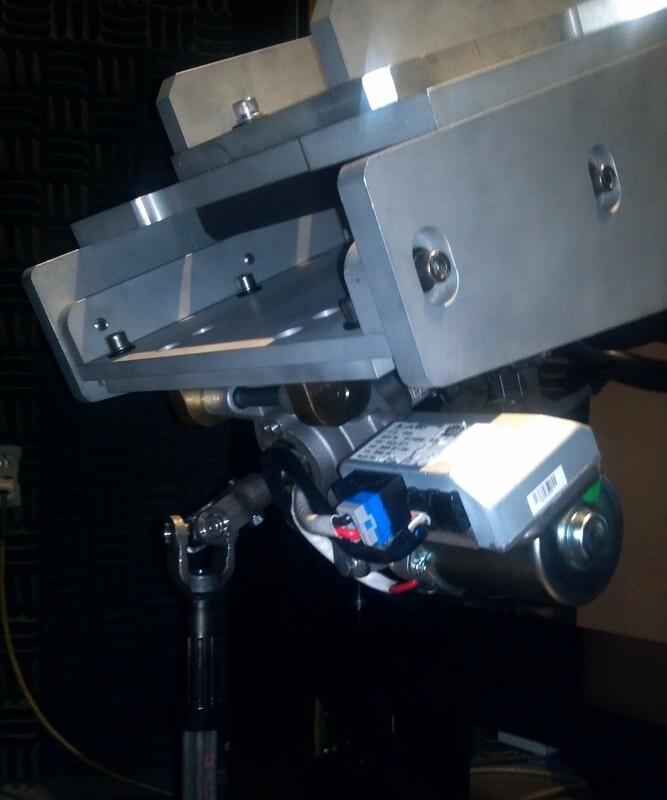 When fitted with TTL quadrature encoders mounted to the steering column, shaft, etc. component torsional performance and hysteresis can be evaluated. Torque resolution is as fine as 0.1N-m and angular resolution of wrap-up of 0.01 degrees. 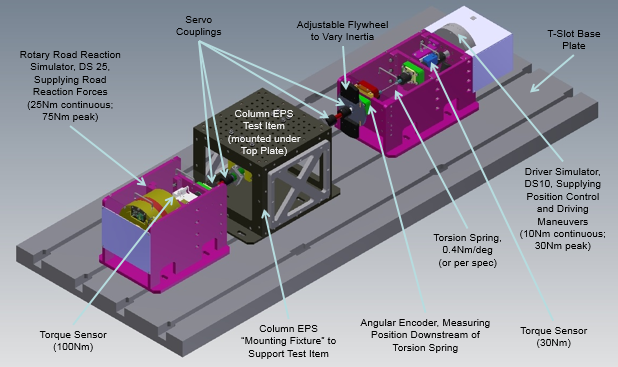 Test stand software, a variant of SMTS, controls the frequency and displacement of the linear motor and torque conditions of the Driver Simulator. The software acquires, computes and outputs position, wrap-up, hysteresis and other outcomes of important. The software can also control the environmental chamber supplying conditioned air. 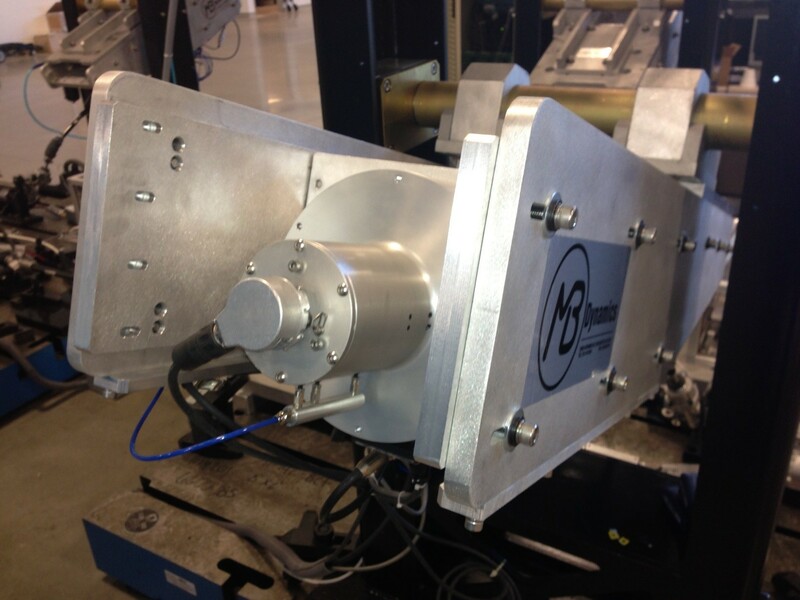 MB provides a Column Stand for mounting a steering column assembly, column EPS, and or a Driver Simulator. The steering column attaches to this Column Stand using MB-supplied, or end-user supplied, brackets at the same structural connect points where the column attaches in the vehicle. The Column Stand also comes with a fixture for mounting the Driver Simulator (DS10, DS25, or DS50) and connecting it to the column. 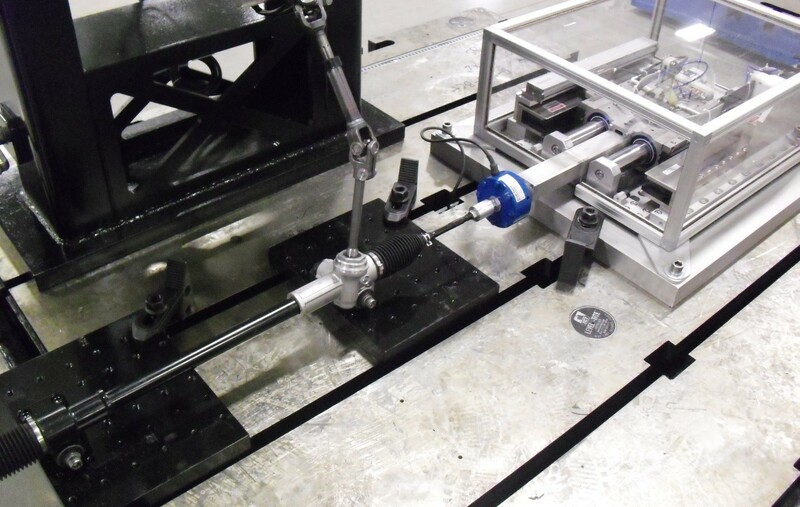 The Column Stand assembly allows space and provision for mounting (or removing) a Driver Simulator, for using or not using bolt-on inertias to replicate different steering wheels, for installing a rotating torque sensor, for mounting steering wheels to the column spline (with Driver Simulator removed), and for using or not using a rotational spring to de-couple the inertia of the Driver Simulator. 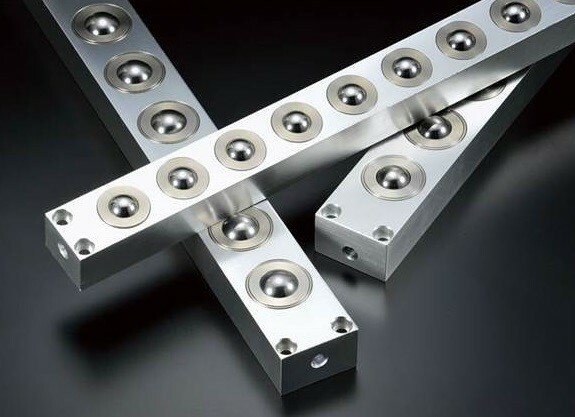 To mount the column and I-shaft in their in-vehicle positions and angles, MB provides adjustment of the column and Driver Simulator mounting fixtures in the vertical (Z-axis), fore-aft (X-axis), lateral (Y-axis), and tilt or rotation about the Y-axis. Height (Z-axis) adjustments are via a motor drive. Mobility on top of a T-slot base plate by one person is available using MB-supplied air lifters, requiring only a small amount of air to levitate about 3mm. MB provides a Steering Gear Fixture or rack stand for mounting the gear using a stiff, heavy T-slot design weighing 350kg. Different sizes can be provided but this standard MB configuration is 815mm Long x 381mm Wide x 341mm High which provides for varying heights of gears and for different sized brackets or adapters depending on the geometry of the gear. It is sized to mount the centerline of the tie rod / steering gear at 441mm above top of T-slot table surface to align with the rack rattle lever arm and center of Jounce / Rebound / Fore-aft Excitation Fixture.